A sumptuous sun-kissed trio, lavishly fringed and amazingly easy to stitch! Linda’s excellent instructions will guide you every step of the way as you create the fabulous 16 inch necklace, 7 inch bracelet 1½ inch earrings. 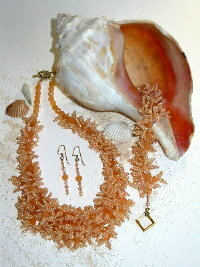 This set looks wonderful with the last of your summer tan and those warm fall colors.